Hi, my name is Kara Mahoney. This is my second season working on this project here in Florida. When I am not down here I have a full time position in the Education Department at the New England Aquarium where I work with our school and family programs. I do a lot of teaching both at schools and onsite at the Aquarium. I have been working at the New England Aquarium since I graduated college in May 2002. I have spent my time at the Aquarium studying whales, teaching kids about whales and the ocean or all of the above! I first started at the Aquarium as a college intern, first with the Harbor Discoveries camps program and second with the Whale Watch program. Upon graduating college, I began working on both the whale watch boat as well as the Science at Sea program, where we would take students out into Boston Harbor and educate them about the marine environment. In the winter months I started working in the Education Department traveling to schools and teaching mostly elementary age children. This led to my current fulltime position. This is the second time I have taken a winter break from the Education Department and been able to come down here and participate in this great project. Just last week I was able to combine my two areas of work with the Aquarium; I went to Hilliard Elementary School in Hilliard, Florida and did four presentations to the entire 1st grade about right whales. I was asked to teach at this school because one of our pilot's wives is a teacher there. Unlike other presentations I have done back in Massachusetts, this one was solely focused on right whales and the fact that right whales are in their backyard. I encountered children who had seen a right whale from a boat (I think almost everyone in Florida goes fishing), some who have seen them from the beach, and some who I am sure didn't know that right whales (or any whales) frequent the waters right off northeast Florida. The children were so receptive! They were grossed out by cyamids (whale lice that live on right whales heads and bodies), excited that right whales travel to their state to give birth, fascinated that they have so much fat (in the form of blubber) on their body, awestruck that such a large whale can eat such little food, and thought that right whales certainly are funny looking. What I thought was great about these children was that I felt that they really understood the problem of ship strikes that right whales can encounter. I showed them a map detailing the coast of the Southeast United States, highlighting the shipping channels and right whale sightings from the 2007 season. Many of the children commented that they have been to Jacksonville and seen all the large ships in the port; from the car carriers to the navy warships to the tug and barges to the container ships. One child took a look at the map and asked: "why can't boats just not go where the whales are?" What a great question to ask! 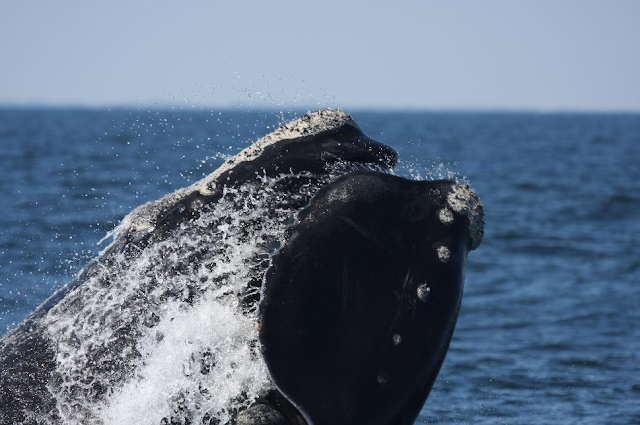 Unfortunately this area is unlike other habitats such as the Bay of Fundy or the Great South Channel (east of Cape Cod, Massachusetts) where right whales often tend to form persistent aggregations. Here the whales tend to move quite a bit and are spread out throughout the entire critical habitat (from Brunswick, GA to St. Augustine, FL) and beyond. Sometimes as far as Miami, FL, the Gulf of Mexico and even Texas! When it comes to the right whale story, it is often very doom and gloom, filled with hunting to near extinction resulting in only about 400 individuals left. So I tried to emphasize with the children things that they could do to help this endangered species. One topic I emphasized was the 500-yard rule. It is illegal for anyone to intentionally approach a right whale within 500 yards, or 5 football fields (I thought that image might be an easy thing for them to remember). Because many of the children spend a lot of time on the water, I thought this was something that they could easily do to help this species. I also tried to emphasize that just by learning about right whales they are helping them. With children and people of all ages it really comes down to knowledge. If people know more about a certain topic they will hopefully share that information with the people around them thus leading to more awareness; and if anything is good for right whales, it is more awareness. The children were excited to know that they could go online at the right whale catalog to look at pictures and sighting histories of individual right whales. I mentioned that some whales have names and that got them excited too! Hopefully the excitement that was generated that day will spread through the local community and that the children will continue to be fascinated by right whales. One of the classes sent me some fan mail after my visit (see the image above), which made me smile and showed me that each of them learned something new that day, which to me is the point of education. I look forward to sharing some other stories about my experiences here in Fernandina Beach, Florida.